In Michigan, you don’t have to travel far to find some wonderfully authentic Mexican fare. From tasty tamales and flavorful fajitas, finished off nicely with top-notch tequila, you’ll find it all at Michigan’s best Mexican restaurants. Here are the 10 best in the state! Did you know that Detroit has a Mexicantown? One of the premier restaurants found therein is Taqueria Lupitas, a restaurant so authentic that a man who both owned a Mexican restaurant and routinely winters in Mexico noted that Lupitas was “...as authentic as it gets.” Featuring an array of tacos, soups, and even breakfast dishes, Detroit's answer to Mexican cuisine should prove top of the heap. Come prepared, as this is a cash-only operation. When MLive suggests you've got the best taco in Grand Rapids, you've got a very compelling reason to visit on your hands. That particular honor goes to Taqueria Sanjose, which offers up not just a taco of staggering quality but also a slate of other Mexican dishes from burritos to quesadillas, tamales and beyond. Located in an old drive-in complete with outdoor picnic tables, Taquerio San Jose not only offers noteworthy food options, but it offers these in a unique and conversation-worthy environment, making it a top pick for Mexican in Michigan. Ann Arbor is home to Tio's, a place that offers some excellent Mexican fare topped off with a few unique twists. 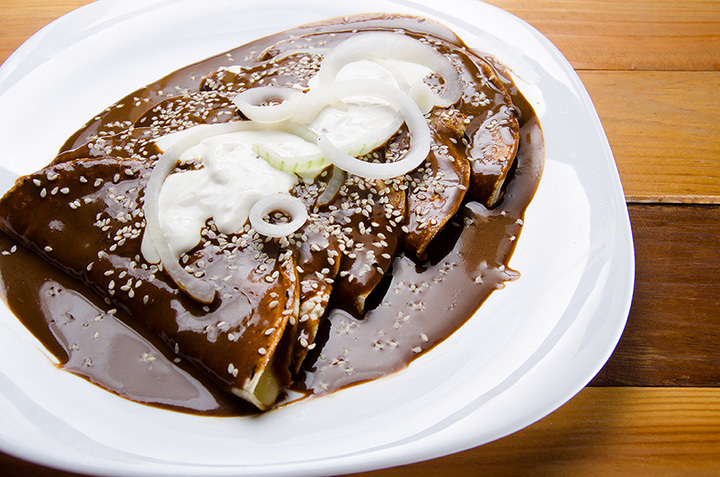 For instance, consider the chicken wings in mole sauce, or the empanadas with your choice of meat or vegetable fillings. Consider the Molcajete platter of different from-the-grill options, or even the chili queso fries. Top it all off with your choice of dessert options including the option for flan and the result is a meal so Mexican it might well be found in Cancun. With locations in Lake Orion and Fenton, Sagebrush Cantina looks to provide one of the best experiences in Mexican restaurant around. Before you even start picking your dinner out, Sagebrush looks to snag you with the weight of its tequila selection. It has a dizzying array of options on this front, sufficient to offer a complete “tequila flight,” a line of shots for diners to try out and see the differences firsthand between different brews. That's a start to conjure with, but from there we'll spread out into a range of tacos, fajitas, combo plates and appetizers of every stripe. Finish it off with dessert—even fried ice cream!—and you'll have a complete Mexican dinner on par with the greats. You might not have known that Three Rivers is home to some of the best Mexican food in the state. El Camino Real is home to an array of options from tostadas de camaron to flautas and beyond, there's going to be something at this small and thoroughly hometown Mexican food operation for just about anyone's taste. Michigan's love for Mexican cooking heads up into the Upper Peninsula as well, as Marquette's Sol Azteca enters the fray. Found on the city's waterfront district, diners will be treated to an excellent view of Lake Superior, the largest of Michigan's Great Lakes. A good view often makes a good meal better, and Sol Azteca won't skimp on the food. While there's a standard slate of offerings on hand, including vegetarian options, the house specials at Sol Azteca might be the most heart-stopping of their kind around. Throw in some great dessert choices and the result is a versatile Mexican restaurant experience for all. Those who were already in the Upper Peninsula for the last entry need only carry on to Escanaba for another shot of Upper Peninsula Mexican fare. At El Patron, the standards will certainly be observed in tacos, burritos and the like, but there are also some unexpected dishes here that will be rare for their kind. The quesadilla sincronizada, for example, is a real rarity; essentially a ham and cheese—and sometimes bean—quesadilla, it's the kind of thing that bridges the gap between Mexico and the Upper Peninsula nicely. One of the premier Mexican restaurants in Kalamazoo promises, in perhaps the simplest terms imaginable, “Authentic Mexican Food, Unrivaled Customer Satisfaction.” Strong words, but it's prepared to back it up with some powerful food and drink choices. Try starting things off with an agua fresca—water mixed with fruit, sugar, various seeds and other choices to make a refreshing drink choice—then follow it up with some of the biggest names in Mexican food from taco to burrito and beyond. Try something different in the pambazo or the alambre platter and discover the fullest depth of Mexican cuisine. A family-owned operation in Holland, the Baja Grill boasts an excellent array of authentic, homemade choices that delivers excellent value for its diners. Not only can diners make their own burrito, but they can get it in different sizes and even potentially without a tortilla. The options go on from there, including different salads, nachos, drinks and more. No, it has nothing at all to do with cheesy horror film. In fact, Sanford's Elvira's Mexican Restaurant will only play host to cheesiness in its food. Table-made guacamole is just the start of the excitement here, as a slate of tacos and burritos will join in the fray, including a breakfast-specific model. From there, it only gets better as nachos, tostadas and more step in. Round it out with several dessert options including flan and the experience is complete.